The A/P Open Item Adjustment application has two separate and distinct functions. First, it allows changes to be made to the due date, discount date, and discount balance of an A/P open item. These changes may be required because of an entry error when the transaction was originally entered or for some other reason. This amounts to changing the terms on an invoice. 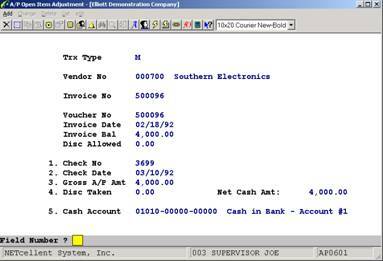 Second, it allows entry of manual payments made toward vendor invoices. Generally, for some reason, a check has been written manually (not printed by the computer) to pay vouchers and it now must be entered into the system. These two functions are performed with two different transaction types. These types are T (Change Voucher Terms) and M (Manual Payment). The changes to be made are entered at the terminal and are stored in a temporary file called the Open Item Adjustment Transaction File. Once the data has been entered and verified as correct, it can be posted to the Open Item File. 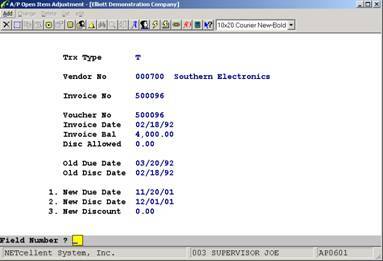 An Open Item Adjustment Register is printed, which can be used as an audit trail for these adjustments. A single manual check may pay several different vendor invoices. This is done by entering a separate transaction for each vendor invoice paid. To verify that the check amount matches what was entered, print the Open Item Adjustment List and compare the check total against the actual check amount. In order for vouchers being paid by a manual check to be shown as fully paid, you must run Manual Check Register Report from the Reports pull down window after posting Open Item Adjustments. Enter T if you wish to change the due date, discount date, or discount balance on a voucher. Enter M if you wish to enter a manual payment, which has been made toward one or more vendor invoices already on file. This field defaults to the last entry. Enter the vendor number of the vendor whose invoice is being adjusted. The vendor's name will display automatically to the right. If you do not know the vendor number, press the F7 key and a search for the vendor by number can be done or press the F8 key and a search for the vendor by name can be done. 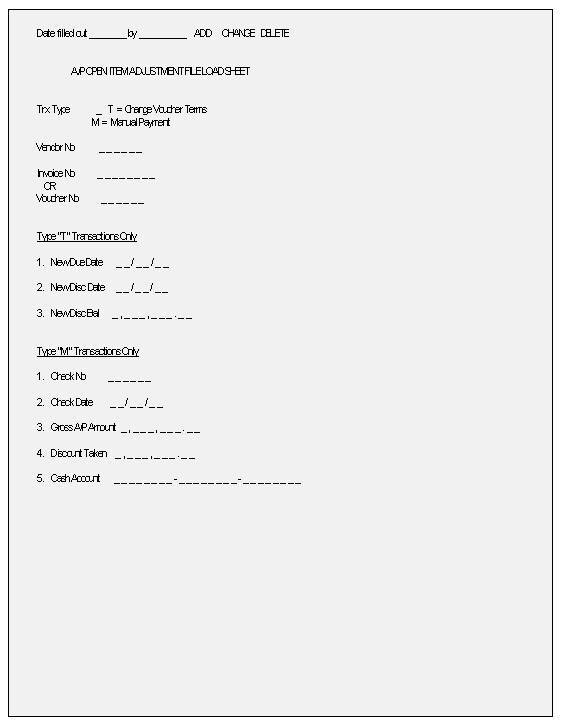 Enter the invoice number of the original vendor invoice for which the adjustment is being made. If you do not know the invoice number, press RETURN, and you will be allowed to enter the voucher number instead. This field is only entered if you choose not to enter the invoice number and enter this number instead. This is the voucher number that was assigned to the invoice during the A/P Transaction Pro­cessing. This field is displayed automatically, no entry is required. This is the date of the original invoice. This field is displayed auto­matically, no entry is required. This amount indicates how much of the invoice amount still has not been paid. If it is negative, it means that the invoice has been overpaid. The invoice balance is arrived at by subtracting the partial payments and discounts taken from the invoice amount. 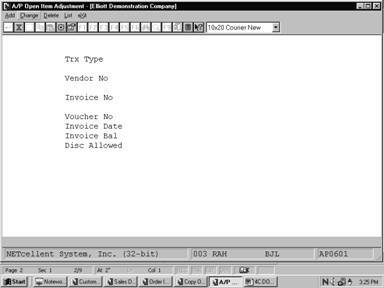 This field indicates the amount of early payment discount that was originally allowed on the invoice. This field is displayed automatically, no entry is required. This is the due date of the invoice. This field is displayed automatically, no entry is required. This is the last date that any early payment discount can be taken on this invoice. The old due date will be displayed on the screen. If you wish to change it, enter the new due date here. If you do not wish to change it, press RETURN. The old discount date will be displayed on the screen. If you wish to change it, enter the new discount date here. If you do not wish to change it, press RETURN. 9 numeric digits with 2 decimal places and an optional minus sign (9,999,999.99-). The original discount amount will be displayed on the screen. If you wish to change it, enter the correct discount amount here. If you do not wish to change it, press RETURN. Enter the check number of the check, which is being entered. Enter the check date of the check that is being entered. Enter the amount of the voucher, which is being paid off. If a discount is being taken, the gross A/P amount will be the check amount plus the discount amount. For example, if a check for $99.00 has been written to pay off a $100 voucher with a $1.00 value discount, then the amount entered here would be $100.00, since A/P is being reduced by $100.00. Enter the discount taken. In the above example, the discount taken would be $1.00. After this field has been entered, the net cash amount will be displayed on the screen. If only one vendor invoice was paid by the check, the net check amount should equal the amount of the check; otherwise, the net cash amount represents the part of the check amount applied to this vendor invoice. The total net cash amounts from all adjustments with the same check number should equal the amount of the check. This should be verified on the Edit List. If they do not, the adjust­ments have not been entered correctly. This field will only be entered if multiple cash accounts are used. Enter the cash account from which the check was drawn. Pressing the F7 key will allow you to search for the account by number or pressing the F8 key will allow you to search for the account by name. . The Post Adjustment Transactions application transfers prior adjustments into the A/P Open Item file among others. Consequently, posting serves to automatically adjust the amount that your business owes to a given vendor. 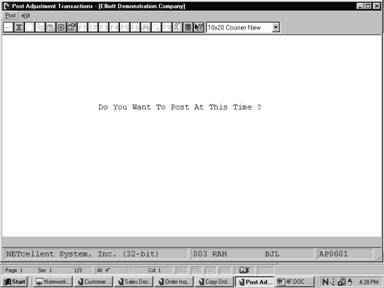 When performing a posting, the system prints a journal of all transactions that were posted. Enter Y if you want to post adjustment transactions or N to decline.